North Korea's foreign minister hinted Thursday that Pyongyang could test a powerful nuclear weapon in the Pacific Ocean in response to US President Donald Trump's threats of military action. The country's Foreign Minister Ri Yong Ho, who was due to address the United Nations General Assembly on Friday but has since dropped out, told reporters in New York that the ultimate decision, however, was up to his boss, Kim Jong Un. "This could probably mean the strongest hydrogen bomb test in the Pacific Ocean. Regarding which measures to take, I don't really know since it is what Kim Jong Un does," said Ri. Ri's comments came just hours after Kim said that Trump would "pay dearly" for threatening to "totally destroy" North Korea. In a rare direct statement, Kim said he "will consider with seriousness exercising of a corresponding, highest level of hard-line countermeasure in history." "I am now thinking hard about what response he could have expected when he allowed such eccentric words to trip off his tongue," Kim said. "I will surely and definitely tame the mentally deranged US dotard with fire." A dotard is a senile old person. Kim also said the comments were reflective of "mentally deranged behavior." 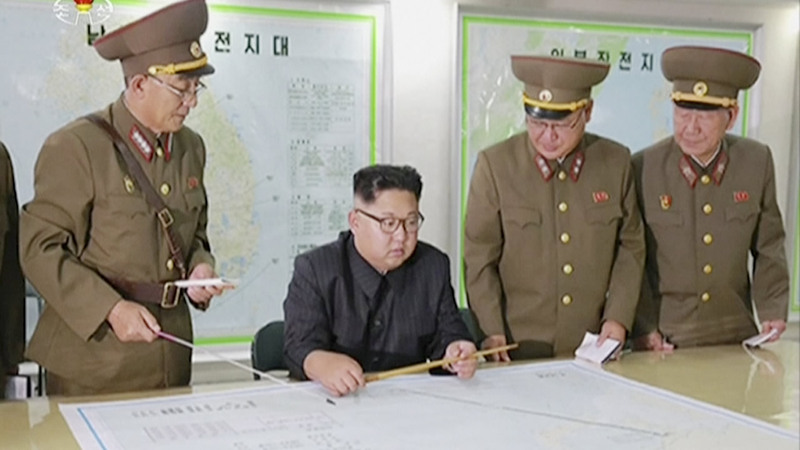 The phrase "highest level of hard-line countermeasure in history" could be considered an escalation in the choice of language used, said Vipin Narang, a professor of political science at MIT and expert on deterrence and nuclear policy. "This is clearly trying to coerce the US into playing ball," Narang told CNN. In his first address to the United Nations as US President, Trump said that the US was ready to "totally destroy" North Korea if it was forced to defend its allies, a warning seen as unprecedented for a US president delivering an address to the world's leaders and top diplomats. Responding to the speech, Kim said Trump's comments amounted to an insult. "I'd like to advise Trump to exercise prudence in selecting words and to be considerate of whom he speaks to when making a speech in front of the world," Kim said. A handful of North Korea analysts believe that this is the first time Kim Jong Un has ever released a first-person statement. "This is unprecedented, as far as we can tell," Narang told CNN. "He was clearly offended by the speech, and what concerns me most is the response he says he is considering." Asked to respond to Kim's statement, White House press secretary Sarah Sanders told CNN on Thursday night, "Not at this time." North Korea was scheduled to speak at the UN General Assembly Friday night, but dropped off of its planned roster spot. The country could still get a slot at another time. The White House, meanwhile, took the another step in its so-called "peaceful pressure" campaign to rein in Pyongyang's nuclear program, expanding sanctions on North Korea and those who do business with the country. Though the majority of North Korea's imports come from China, Treasury Secretary Steve Mnuchin said "This action is directed at everyone" and the steps are "in no way specifically directed at China." The executive order Trump inked just ahead of the lunch enhances Treasury Department authorities to target individuals who provide goods, services or technology to North Korea, Trump said. He said the order would also allow the US to identify new industries -- including textiles, fishing and manufacturing -- as potential targets for future actions.